They can print a "Birth Certificate" for your car for a modest price (around 20 Euros). Volkswagen Group (United Kingdom) Ltd. If you fancy trying number 3, the following will help. In any case, you'll learn something new about your car. If your VW is pre-70 model year (pre-Aug 69), you will not find the production plate, and you will have to contact one of the addresses above, or estimate it from a comparison of chassis numbers. Sorry! The Chassis plate is found on the front panel on Beetles, Type 3s and Type 4s. Type 2s have a similar plate on the bulkhead behind the left-hand front seat, with extra details included. 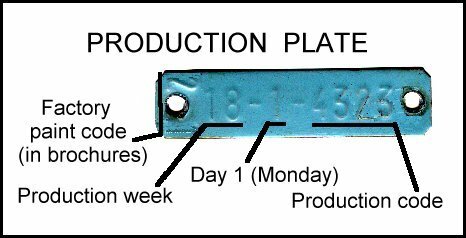 A Type 3 chassis plate is shown above; if you have a Beetle, the VIN will start with a '1' ; a Type 2 (Bus) starts '2'; a Type 4 (411/412) starts '4'. to avoid earlier numbers being duplicated. Thus 1*5 123456 is a 1965 Beetle, but 1*52 123456 or 1*53 012345 are 1975 Beetles. The * is a single number and depends on the body style of the vehicle (eg standard or Super). From August 1969, VW fixed a production plate which holds the information you need for the next step. This plate is found on Beetles, Type 3s and Type 4s on the front panel near the chassis plate, but painted in the body colour. It gives the production date as the week of the calendar year, and the weekday. Thus this car was made on Monday, Week 18 (a 1971 calendar lets you work out the actual date). Its factory colour code is 21, which is Marina blue (shown in brochures). For Type 2s, the details may be found on the plate behind the left-hand front seat. Look for a sequence like the one above. Mine (1974-model) is in the bottom left-hand corner of the plate; week 43, day 5 (Friday). I think some numbers on the plate are the factory extras fitted. The factory paint code figures for this should be 07 (Brilliant Orange) and 06 (Pastel white) but I see no certain indication of that. Week 43 for a 1974-model means week beginning 22nd October 1973, and a calendar reveals the build date as Friday 26th October 1973. Buses up to 2*32102496 (where * is a single digit representing the model type). Type 4s (412s) up to about 4132040000 (more details needed to tie this one down). Cabrios seem to have had chassis numbers allocated before Karmann finished them, so the date of manufacture is later than the chassis indicates. Some Campers were fitted out in the UK and may be around a year older than their registration date, so it's worth checking M-reg vehicles. Some other VW models took a while to sell, and may have considerably later registrations than their manufacture date. Contact VW at Milton Keynes 0800 711 811 for a confirmation letter for DVLA. Contact Stiftung Auto Museum Volkswagen, Dieselstraße 35, 38446 Wolfsburg 1, Germany for a 'Birth certificate' which now costs 20 Euros (I think). Surprisingly, the Camper was not registered until October 1974, with an 'N' year plate. However, now the UK Government has withdrawn the free tax concession for vehicles manufactured after December 31st 1972, it won't save me the tax after all. If this page helps you claim your rightful free tax, I shall be very pleased for you. So now you can work out your car's date of manufacture to within a week or so (and maybe the exact day using a computer calendar or your old diaries! ), and in some cases how to find out the original colour. If you find any inconsistencies, please let Dave Hall know the details. There may be a rational explanation, but it may be a 'wrong-un'. International standards require a 17-digit VIN number now. This mysterious number is found on a plate or sticker as well as engraved on the body in letters about 1 cm high. In the UK, vehicle numbers have a registration year letter, too (though personal plates mask this give-away!). From March 1998, the UK year letters have changed twice a year; on 1st March and 1st October. This is found on the front panel by the engine cover lock, or on the inner wing. It is a rivetted plate about 8 cm by 4 cm. Recent models seem to have an adhesive sticker instead. It has the chassis / VIN number engraved, and the details of load etc. It also has the production codes on it, as found on the production plate. Since 1970 (at least), VW have added this information somewhere on the body when built. Even the water-cooled VWs have this production plate; this bar-code version is fixed behind the grill on Chris' Polo CX, but the numbers are also engraved on the chassis plate on the front panel by the bonnet (hood) latch, or the right-side front inner wing. Newer models have it on a sticker on the suspension turrets, inner wings or other places. Another week 18, (but this time in 1983), and a Thursday, which makes it May 5th 1983. So now you can work out your car's date of manufacture to within a week or so (and maybe the exact day using a computer calendar or your old diaries!). This is the final letter before the 6-digit serial number at the end of the VIN. If you find any inconsistencies, please let Dave Hall know the details. There may be a rational explanation!